Preheat oven to 400°F. Line two baking sheets with parchment paper and set aside. In a medium saucepan over medium heat, combine butter, water and salt. Whisk until butter is melted. Add 1 cup flour, stirring rapidly until a ball forms and pulls away from the sides, about 5 minutes. Stir until it's no longer sticky. Remove saucepan from heat and let mixture cool, about 3 minutes. Pour mixture into a stand mixer bowl fixed with the paddle attachment. Add in eggs one at a time, stirring it into the mixture. Stir in cheese and pepper, and remaining flour. If the mixture is still pretty liquid-y (as in, it can't be held in your hand as one cohesive dough), add in 1 tbsp flour at a time until it is cohesive. Scoop tablespoonfuls of dough, spaced three inches apart, onto the baking sheets. Sprinkle with Parmesan cheese. 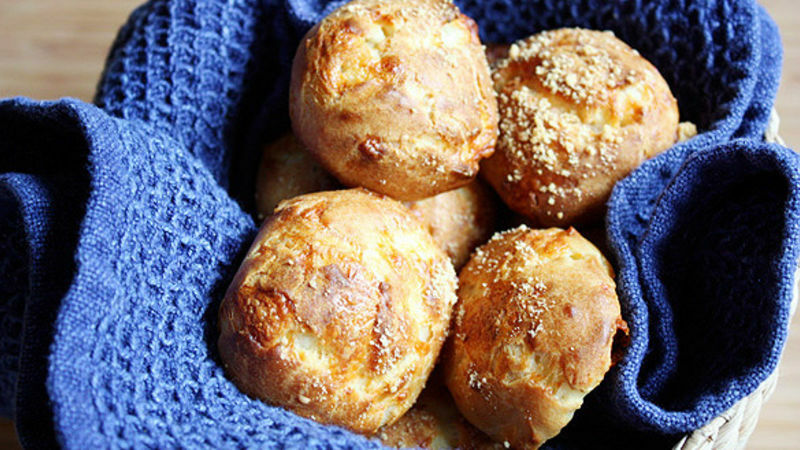 Bake 30 minutes or until gougeres are a golden brown, rotating halfway through. The insides should be slightly moist when done. It’s hard to believe sometimes, but there is such a thing as “too much of a good thing.” When it comes to recipes, this is especially true. I mean, who wants to eat a cake made with fudge, peanut butter, toffee, caramel and bacon? OK, this could actually be good – but I think you get the point. Sometimes, simpler is better. That’s why I love these Gougeres. They’re simple to make, and there’s a clear star of the show on the ingredient list – the warm, gooey Gruyere cheese pocketed in each center. Everything else is probably already hiding in your cabinets or refrigerator. And in less than an hour, these babies can be on your dinner table, piping hot and ready to serve with a warm soup or yummy pasta dish. People can be fickle when it comes to cheeses. While my dad and husband could live in a cheese factory, my mother won’t even entertain the thought (we actually tried to get my mother to visit a nearby cheese factory recently – to no avail). Give me Emmentaler and Roquefort any day, but my brothers can’t stand the sight of the stuff. We all have our tastes. So, if you’re feeling queasy at the idea of a Gruyere-filled puff, you can substitute it with sharp cheddar, Parmesan or another tangy, softer cheese. But for those with an undying love for all things cheesy, Gruyere is the best way to go. Its subtle yet pungent flavor, reminiscent of fresh Parmesan but a little more on the wilder side, goes perfect with the mellow flavors of the enriched dough (the butter and eggs, that is). While we enjoyed these bite-sized puffs with creamy broccoli soup, they go great with any light, savory dish. Just be sure to eat them warm and straight from the oven, as they’re best eaten right away. But that shouldn’t be a problem!